The 2013 Acura RDX is a new generation of the model that offers more room, more power, and more fuel-efficiency than the 2012 model. Its styling is more in line with its larger sibling, the seven-seat Acura MDX. The changes should help the model better compete in the compact luxury crossover class against the likes of the Audi Q5, BMW X3, and Land Rover Range Rover Evoque. The RDX first debuted in the 2007 model year with Acura’s Super-Handling All-Wheel Drive (SH-AWD) as an option. The company marketed the model as a model with sports sedan performance and handling with the utility of an SUV. Thus far, the model hasn’t really lived up to expectation with it selling just over 15,000 units in 2011. The big news for 2013 is that Honda has ditched the turbo-charged 240 horsepower four-cylinder engine that has been offered in the model since it first debuted. The 2013 RDX will be offered with a 3.5-liter V6 engine, which will produce 273 horsepower in the RDX. A similar version of this engine is offered in the Acura TL sedan and Honda Pilot. The death of Honda’s turbo-charged four-cylinder is interesting in that several of its competitors are favoring turbo four-cylinder engines or normally aspirated 6-cylinder engines in smaller models. Honda’s turbo-charged four was only featured in the RDX and produced a stout 260 pound-feet of torque. The problem with the engine was that it surprisingly had poor fuel economy. It also required premium fuel whereas the V6 does not. The 2012 RDX 5-Spd AT SH-AWD w/ Technology Package has EPA-estimated fuel economy of 17-mpg city and 22-mpg highway. This is very poor considering the Evoque with a turbo-four of similar output attains fuel economy of 19/28, making its highway fuel economy more than 20% better than the RDXs. Based on a preliminary EPA mileage estimate by Honda, 2013 Acura RDX will offer fuel economy of 19-mpg city and 27-mpg highway with SH-AWD and 20/28 with front-wheel drive. This is an impressive improvement, especially considering a 33 horsepower power bump. For the first time, the RDX will feature a standard 6-speed automatic transmission. The model also has a lighter-weight all-wheel drive system, which is also found in the 2012 Honda CR-V.
For 2012, the RDX comes in four trim lines: 5-Spd AT, 5-Spd AT SH-AWD, 5-Spd AT w/Technology Package, 5-Spd AT SH-AWD w/Technology Package. The base 5-Spd AT has a starting MSRP of $32,895 while top line trim has an MSRP of $37,995 and comes standard with leather seats and sunroof. The 2013 RDX has a starting MSRP of $34,320, which is a $1,425 increase. There is also a $885 destination fee. All-wheel drive is a $1,400 option. The RDX Technology package will set you back an additional $3,700. The RDX 5-Spd AT AWD w/Technology Package w/Technology Package is $39,420. The 2012 RDX has cargo space of 60.6 cubic feet with the rear seats folded down. This is above average for its class, but smaller than more economical models such as the Chevrolet Equinox. The RDX’s cargo space will increase for the 2013 model year. The 2013 RDX has available features that include Pandora® internet radio, a three view rear camera, Keyless access, and power rear lift gate. The rear opening is six inches wider than the 2012 model. The 2013 RDX also has new 5-spoke 18-inch wheels as a standard feature with improved 4-wheel disc brakes. The 2013 RDX’s Technology Package includes features such as Acura Navigation System with Voice Recognition, AcuraLink Real-Time traffic with Traffic Rerouting, Acura ELS Surround audio system, and a 60 GB hard drive with up to 15 GB allocated for music storage. A longer wheelbase, wider track and lower center of gravity provide the foundation for the new RDX’s improved handling and ride quality. 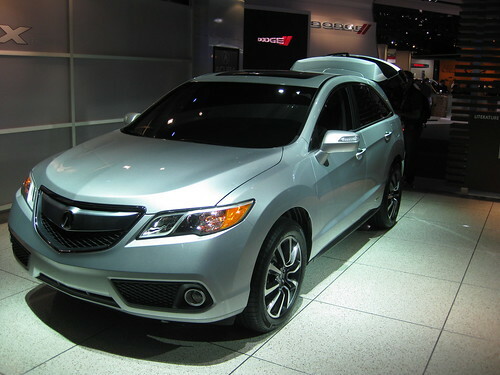 The 2013 Acura RDX changes seem to improve the model in every way, making it a stronger competitor in its class. The model has is longer and wider with much improved fuel economy. The model will be built at Honda’s East Liberty, Ohio plant. The 2013 RDX release date is in Spring 2012. You can get one at one of Acura’s 272 dealers across the U.S. Those seeking a sportier model may want to consider the Acura ZDX. In some good early news for the 2013 RDX, the model has been named to the Insurance Institute for Highway Safety’s list of “Top Safety Picks” making it one of the safest SUVs on the roads. The RDX received a low “Marginal” score for its roof strength test results, which gauges how the model would fair in a roll-over accident. The 2013 scored “Good” across the board in IIHS crash tests, including roof-strength. If you like the RDX, vote for it in the “Which is your favorite luxury compact crossover model?” poll, at the bottom of our post on the 2012 BMW X3.